When the Penguins finally decided on new general manager Jim Rutherford this summer, it did not take very long for him to make some waves. Rutherford was hired June 6, and on June 27, just three weeks later, James Neal found himself with a one-way ticket to Nashville. The return surely had to be a king's ransom, right? The Penguins found themselves with Patric Hornqvist and Nick Spaling in return, which left most casual fans asking "who?". "It's not that Hornqvist, or even Spaling, are necessarily bad players. 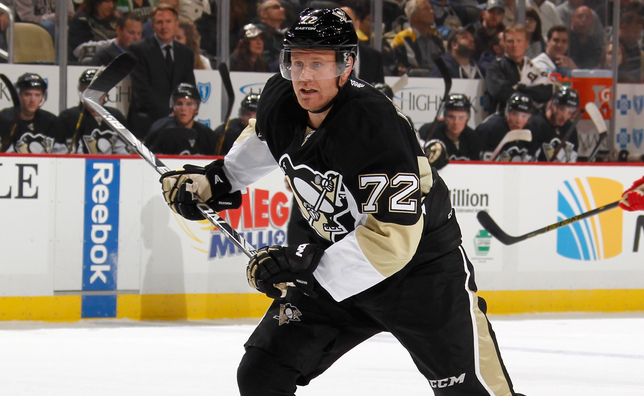 Hornqvist is a solid, two-way winger who is a good bet to score 20-25 goals. It's that one All-Star is always better than two good players." On the other end of the spectrum, many fans were left scrambling to figure out who Patric Hornqvist and Nick Spaling were. Some looked up their career stats and compared how the Penguins lost out in the trade. Some looked up photos and videos of the goals and styles of plays. What they found was that Hornqvist did not have as good of a release as Neal -- hardly anyone does. He does not do anything particularly flashy. While it may not be exciting to read about or even watch, this was EXACTLY what the Penguins wanted and needed. Hornqvist punches his time card at his "office"
Of course, Sundqvist did not make the team, but I was 50% right. On October 1, Crosby and Hornqvist played together in Detroit, and they have been practicing and playing together ever since. As Michelle Crechiolo mentioned in her article on the Penguins website Wednesday, Crosby (1st pick of the 2005 draft) and Hornqvist (230th, last of that same 2005 draft) are now linemates. As a matter of fact, Crosby is also paired up with an undrafted player in Chris Kunitz. It's not exactly who you would think of when asked who is flanking the best player in the world, but this is oftentimes what makes the best chemistry. The result through two games shows that Mike Johnston will not be splitting this line up any time soon. Crosby (3G, 3A), Kunitz (1G, 1A), and Hornqvist (2G, 2A) have been on fire. It would seem that this line is perfect for all involved. Hornqvist has a very straight-line game, much like Kunitz, but Hornqvist's addition to the line gives Kunitz the ability to have more freedom to shoot. 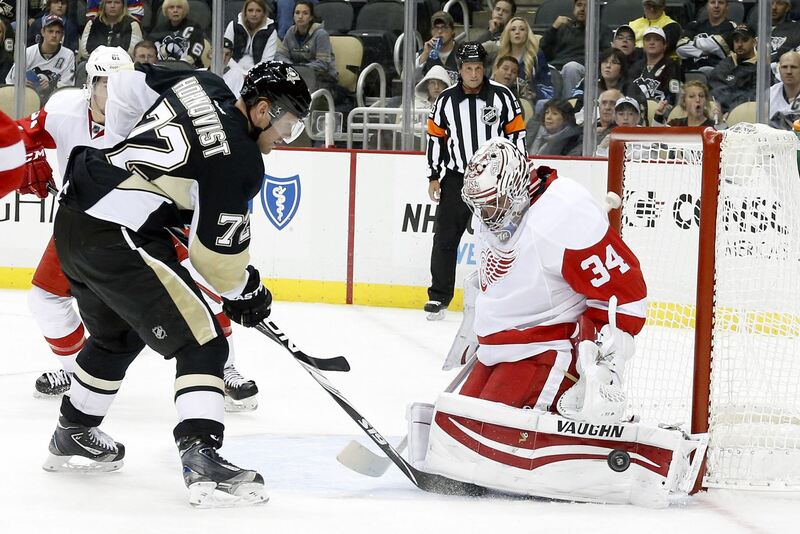 Hornqvist and Kunitz essentially take turns at the front of the net. This lets Kunitz shoot from the slot a bit more. It also allows Crosby to utilize his other-worldly talent to free wheel a bit more in the offensive zone, and provides a better chance for a screen. The results through two games are extremely encouraging for the Penguins. Hornqvist has 4 points, and he leads the team in shots on goal with 13, including 9 -- wow -- against Toronto on Saturday. He has also attempted a team-leading 19 shots through two games. As seen from the video above, he has a nose for the net. His goal on Saturday was scored in the middle of a line change as he darted to the front of the net to find the loose puck. The early returns are in, and Patric Hornqvist will quickly be a household name in Pittsburgh. He may not be flashy or have a lightning release, but I am betting most teams would tell you he is much harder to play against than James Neal. It turns out he is exactly the player we thought he was... and that is perfect for this team.